Not only what we talk about, but what we think about is screened by the Lord. Is it acceptable to the Lord? Saul's problem is a common one. He thought his "overall performance" was good enough to see him through. All the while, God was placing the emphasis on obedience to specific directives. God has not changed. "Obedience is better than sacrifice." God has a running account of our kept and forgotten vows, and so often as the occasion arises, He calls for their fulfillment. Humanity has not changed. When we lose touch with the true and living God, we start making our own. "Thou shalt worship the Lord thy God, and him only shalt thou serve." One of our great problems is that we ask God for answers and guidance and then debate Him over His response. "Whatsoever he saith to you, do it." "We ought to obey God." Here is the argument settler. If you can't do a thing in accordance with His Word and will, don't do it. "Not my will, but thine, be done." God's paths are clear. It is our dull hearing that gets us into trouble. "Obedience is better than sacrifice." 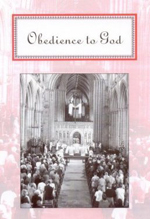 "We ought to obey God rather than man." Here is a condition and a promise that we cannot afford to ignore if we are to live happy and fruitful lives. Jesus beckons us to the world's greatest business. Only in eternity will we see just how great. Stop what you are doing and follow Jesus in this, the most rewarding work of all! "He that winneth souls is wise." Contrary to what we sometimes think, we will be rewarded not for our success but on the basis of our faithfulness. "Be thou faithful unto death, and I will give thee a crown of life." Our job is dedication - His is deliverance. If we give attention to doing His will, the Lord is good enough to give us even beyond what we ask. "If they obey and serve him, they shall spend their days in prosperity, and their years in pleasures." Job 36:11. Behold the emphasis on obedience and service! Looking for a success formula? Who can afford to overlook this one? Whatever the problem, He is the answer. Obey and follow Him. The responsibility of caring for and leading belongs to the shepherd; the responsibility of obedience and following belongs to the sheep. The person who is well acquainted with the Lord will not be a stranger to His commandments. Men who listen to what God has to say will usually have an audience to hear what they have to say. "Obedience is better than sacrifice." The crisis will pass when we meet God's conditions. "Call upon me in the day of trouble: I will deliver thee, and thou shalt glorify me." If we major in what is right in God's sight, we don't have to worry about what it will look like in the eyes of man. The greatest need of the Church today is wholehearted obedience and down to earth preaching. "As my Father hath sent me, even so send I you." The will of God will almost invariably be contrary to the ways of man. "For my thoughts are not your thoughts, neither are your ways my ways, saith the Lord." No man owns a part of that city until God owns all of that man. Father, we know that if You are mighty to save, then You can surely speak to us. Give us Your divine directions today by Your spoken Word, and may we have obedience to follow, in Jesus' name. Amen. God is not looking for a few shares in our life, but controlling interest. Nothing else will please Him or us. It takes your all to do business with God. "Thou shalt have no other gods before me."